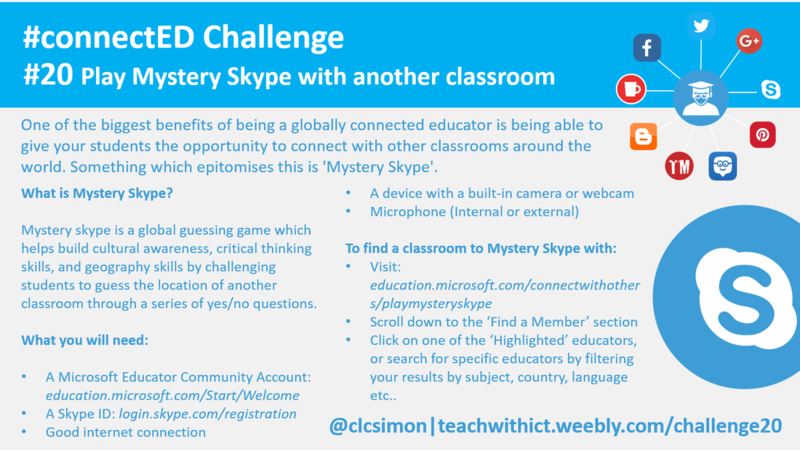 Challenge 20: ​Play Mystery Skype with another classroom. One of the biggest benefits of being a globally connected educator is being able to give your students the opportunity to connect with other classrooms around the world. Something which epitomises this philosophy is 'Mystery Skype'. Mystery Skype is an educational game, invented by teachers, played by two classrooms on Skype. The aim of the game is to build cultural awareness, critical thinking skills, and geography skills by guessing the location of the other classroom through a series of yes/no questions. ​It is suitable for all ages, and gives students an interactive way to build skills one question at a time. Find a teacher to play Mystery Skype with (https://education.skype.com/mysteryskype). Arrange a date and time to play. Don’t tell your students where the other classroom is! Start the Skype call and let the game begin! The first classroom to guess the correct location wins! https://education.microsoft.com/connectwithothers/mysteryskypeonenote - Guide to Mystery Skype.